Muscle spasm is involuntary, sudden contraction of muscle or group of muscles of the body. Muscle spasm is also known as muscle cramp or involuntary hypertonicity. Globally, development of efficient and advance technology, Rise in the demand for athlete activities and support the growth of muscle spasm market are the prime growth drivers of global Muscle Spasm market. 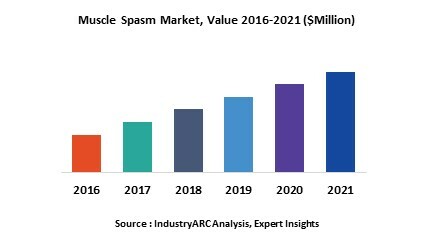 In addition, increase in adoption of of Muscle Spasm for newer applications, and emerging economies such as China, India and others, will create new opportunities for global Muscle spasm market. However, higher cost of the research and development, Limited diagnosis and self-limiting nature of the disease are the key restraints for global Nanotechnology Drug Delivery market. Geographically North America dominated global Muscle Spasm market, and Europe is projected to have fastest growth, owing to rapidly increasing awareness of muscle spasm, its causes and effects and its treatments. Asia-Pacific is considered as an untapped market due to lack of proper healthcare facilities in some Asian countries, and modernizing infrastructure in developing nations such as China, and India in this region. Among all the causes, Muscular injury has the highest market share in global Muscle Spasm market. This report identifies the global Muscle Spasm market size in for the year 2014-2016, and forecast of the same for year 2021. It also highlights the potential growth opportunities in the coming years, while also reviewing the market drivers, restraints, growth indicators, challenges, market dynamics, competitive landscape, and other key aspects with respect to global Muscle Spasm market.